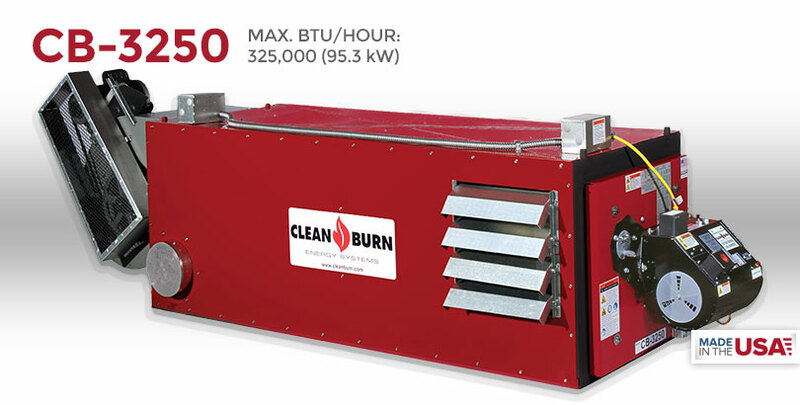 The largest of our four Clean Burn low profile models, the Model CB-3250 waste oil furnace is rated at approximately 325,000 BTU/hr. and is UL listed for use as a unit heater or central (ducted) furnace. This unique low-profile unit provides more installation and functional options than any other waste oil furnace. The low profile is ideal for limited ceiling heights, and the range of installation options is unsurpassed. Clean Burn waste oil furnaces are engineered from the ground up to burn a wide range of waste oils for free heat, and comply with all EPA regulations. Your Clean Burn distributor is a fully trained and highly experienced expert in waste oil combustion technology. With Clean Burn you get a superior product, unrivaled support and the greatest return on your investment for years to come.